I don’t recommend cupping to all my clients. Some of them have healthy, toned, well hydrated muscles that can just happily release under my fingertips without much fuss. But some of them are really, really stuck. Trigger points, especially in the traps along the shoulder blades just can’t quite release. Quads, hamstrings and calves feel like they can’t move without major pressure which can be really uncomfortable for a lot of people. The erectors that run down their backs on either side of the spine are rigid and just don’t seem to want to truly release. So after the massage I’ll say “You might want to try cupping.” To which many of them reply either “Oh yeah! I’ve been wanting to try that.” Or “What the heck are you talking about?” For the second group, this post is for you. There are different types of cupping and different types of cups. 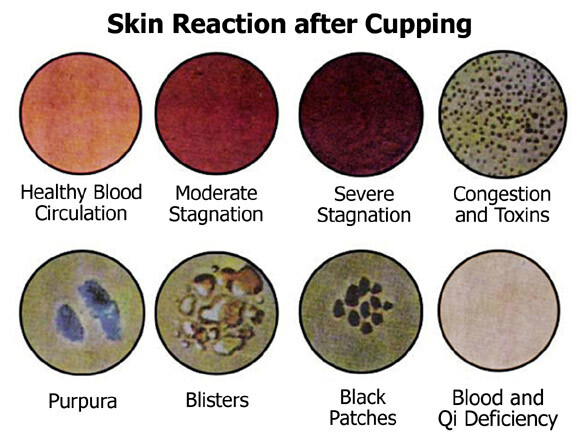 Acupuncturists and other eastern medicine practitioners can do “wet cupping” and “fire cupping.” In wet cupping actual small incisions are made in the skin and the suction from the cup pulls up stagnation in blood. Fire cupping uses glass cups and the practitioner uses a flame to create a vacuum in the cup and sets it on the skin which creates a seal and draws the tissue up. As a massage therapist both fire and wet cupping are out of my scope of practice. All cupping lifts the tissue up and causes blood flow and oxygen to come into the area. I use silicone cups that create suction simply by squeezing and attaching the cup to the skin like a tiny, sanitary plunger. I don’t use the type of cups that require a hand pump. Those can provide a very intense and uncomfortable cupping experience and I never want a client to feel uncomfortable on my table. Flash cupping where I move the cup up and down the muscle squeezing and releasing the cup. Static cupping where I attach the cups to the skin and let them sit for a bit –usually 3-6 minutes. While I’m doing the static cupping I will generally be doing hands on massage elsewhere on the client while the cups are doing their thing. Whatever type of cupping I’m doing, there is always the possibility for cupping marks. Here’s a handy chart to show you what they could look like. I’ve only ever seen the first three on my clients and they generally go away within a week or two. The blisters are a byproduct of careless fire cupping so that is not something you would see from getting cupped by a massage therapist. But if this is the week for your swim suit calendar shoot, it might not be a great idea to schedule your cupping massage. Some people never mark. Some people leave my table looking like they have been dotted with pepperoni. One thing to note: Cupping marks are NOT bruises. They are not broken blood vessels. They are not sore to the touch. They are just places where stagnation has been pulled to the surface of your skin where the lymph system can carry it out. The marks can last from 24 hours to 2 weeks. The cupping marks only appear where you have stagnation. I can use the same cup with the same pressure on either side my client’s body and one side will have a deep purple mark and the other side will have nothing. Most of my clients find cupping to be a very profound and healing modality. It’s as effective but much gentler than deep tissue massage. It is very relaxing and can help relieve all sorts of painful complaints from tight shoulders and traps to plantar fasciitis. Have any questions about getting cupping at Firestone Chiropractic and Wellness? Feel free to drop us a line on our contact page.